How to Become a Court Reporter in Florida? How Much Do Court Reporters Earn in Florida? Court reporting is a process in which words spoken in court are transcribed into written text. This legal record then serves as accurate transcription during the appeal stage of a case. 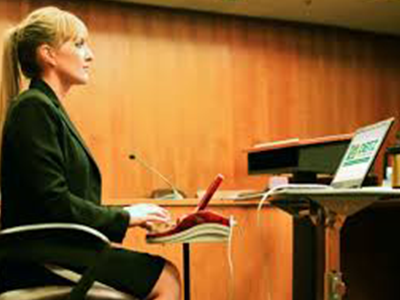 In addition to judges and attorneys, court reporters play an equally important part in the dispensation of justice. When an appeal is filed, the appellate court relies upon the written record of spoken words during the trial stage to determine whether the court followed appropriate legal principles and procedures in reaching a final decision. If you’re a resident of the State of Florida and are thinking of becoming a court reporter then the good news is that you do not need to be licensed or obtain specific educational credentials beyond high school. However, court reporting is a skill, which can be learned only though proper education and training. Complete a formal Court Reporter Program –There are many technical schools and community colleges in Florida, which offer a variety of certificate and associate’s degree level programs in court reporting. Depending upon which path you chose (with certificate being of shortest duration), you may be able to complete your educational requirements from 28 months to three years. Both, the certificate programs in court reporting and the associate’s degree in court reporting emphasize on teaching their students legal proceedings and how to use transcription machines accurately at a specific speed. Get the Florida Professional Reporter Certificate – Getting licensed is not a prerequisite to working as a court reporter in Florida. However, there are many who voluntarily take this certification exam to enhance their employment prospects. Obtaining a certification also highlights that you have achieved a certain skill level in your trade. A closed-book examination is conducted following the seminar. You will need to score 80% and above to obtain this certificate. Find a Job – The State of Florida is the third biggest state in the United States which employs court reporters. However, job hunt takes time, so be patient. Start with signing up with the Florida Court Reporters Association (FCRA). Their website has a “Classifieds” tab where you will find a list of vacancies. In addition, you can also visit your local courthouse and enquire about job vacancies. The following statistics are taken from the US Bureau of Labor Statistics (BLS) and reflect the numbers from May 2017. The State of Florida is only behind Texas and New York for employment of court reporters by state, as of May 2017. However, O*NET OnLine predicts 2% growth rate in this field from 2016 to 2026. This means that approximately 100 new jobs will be created in this field in these ten years. Therefore, expect a stiff competition.